Recently I finished this environment concept done for DeviantArt. They assigned me a panoramic type of piece of a temple chamber with ten statues in it, all facing a pedestal in the center with a mask. The idea was to use it as a full piece and to able to focus/zoom on each statue. The final image is 10500 on 4500 pixels. With every project I undertake, I like to kick things of with some preliminary sketches. It allows me to get any pre-formed ideas on paper fast without worrying too much about the tools. I can just focus on the design brief and story. By the end of this stage, I make sure I have one or multiple ideas ready that I can present to the client. 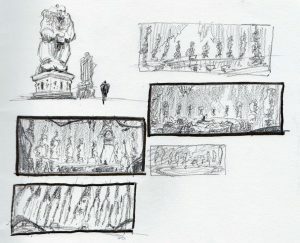 For this project, I presented a sketch for the environment, showing the central chamber with it’s statues. For each statue I also did some separate sketches which were later combined and cleaned up. To get the interior of the temple and proportions of each statue correct, I blocked out the main shapes in 3D. It allowed me to move the camera around and decide on the best camera angle possible. Just like in the sketch, I’ve put the camera low to emphasize the height of the temple and it’s statues in it. During the process we noticed the image became too flat and static because of the presentation of the statues. The whole piece felt as being in a museum instead of a temple. We opted for a more immersion experience, where there was room to explore the temple further. That is why added more depth and verticality to the environment and decorated it with ruins and vines. There was also need for less uniformity between the statues so I moved them around the environment.